For many years AssemblyTV was mostly made using MiniDV equipment. Programs were shot, edited and mastered onto tapes. Reference recordings of whole broadcasts were made in parallel on VHS and MiniDV. All this adds up to a lot of tapes. The photo below should give you an idea. On the left are three years of VHS reference tapes (2000, 2008 and 2009). They used to be a cheap way to get a full copy of the broadcast in a format suitable for home viewing. Keeping a copy for three months is a legal requirement for broadcasts in Finland. Quality is awful of course and the tapes take a lot of space, so we probably won't keep these for much longer. We also won't make any more VHS reference recordings because people don't have recorders at home any more. The two piles in the middle are MiniDV from 1999 to summer 2009 with a few copies of old S-VHS tapes from 1994 thrown in for good measure. 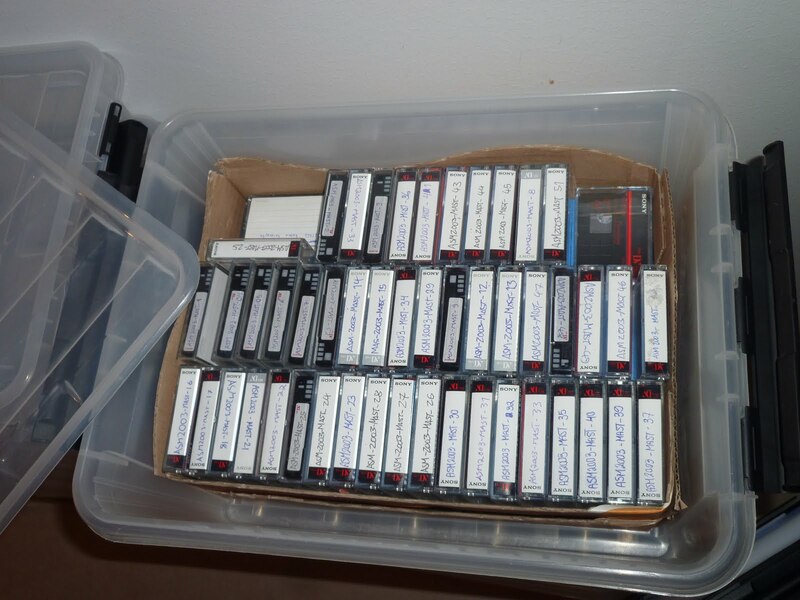 The second photo shows the top level of the 2003 box with master tapes for edited programs. The lower level contains the reference copies of the whole broadcast except for some bits when the person changing tapes wasn't paying attention (ahem). The final pile has compo tapes at the bottom, seminar tapes in the blue boxes and junk in the yellow boxes. This junk includes some old S-VHS tapes from 1994 an 1999. We think we have MiniDV copies of these, but need to check before we get rid of them. We are generating less tapes now as edited programs and compos are handled purely on solid state and hard disks. The seminars and live material are still recorded onto disk and tape in parallel which has saved us from a few catastrophies. The reference recording is also still on MiniDV because long disk recordings tend to have the video and audio out of sync and files with acceptable quality are rather big. We also have a lot of MiniDV tapes which have only been used once. We hope that disk storage will be reliable by the time we run out of these. What's in this for you then? 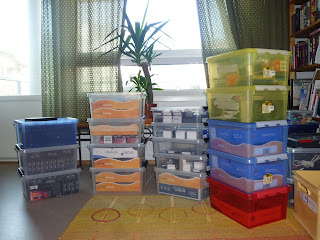 After sorting the tapes, Aketzu has been capturing material in bulk. It will take us time to get it all sorted and identify useful programs, but I have uploaded a couple of old clips start. During the event or soon after we hope to get an almost complete listing of viewable compo entries from the last ten years and more online. The first video is a relatively rarely seen demo from Moppi Productions. Jalousie only finished 12th in the Assembly 2004 demo compo and it seems obviously incomplete. A final version was never published. I'm publishing Jalousie here, because it offers just a little bit more of the weird Moppi aesthetic familiar from demos like gerbera, which I really like. Think of it as a rare B-side. The second video is an episode of the Finnish for Foreigners series made for Assembly 2001. It was taken from the Good Morning Assembly show and thus has a short introduction in Finnish, but the actual program is in English. The program features AssemblyTV's probably greatest comedian Mika Salo (not the ex F1 driver). His best material is in Finnish and I will post some of that later in a Finnish post. I hope you enjoy these. We've got some hacking and maybe a post in Finnish planned for today. Tomorrow we'll move to the arena and should start posting some progress reports and photos of the construction. oh man. I really hate tapes. Takes so long to transfer as you have to do it in realtime. 5 hours of recording takes 5 hours to transfer. I've understood, that some, professional, or at least more expensive, dv cameras have the ability to transfer the dv stream something like 4x speed. 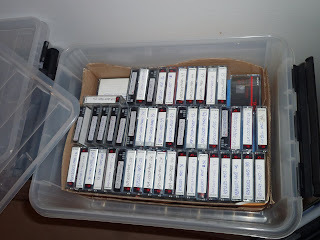 And with such many tapes, do you have dv deck(s)/dv recorder(s) without camera?